"Ah, this is rich! This is one that the Vanguard wants brought in! What do you think, my friend, shall I charge them triple?" 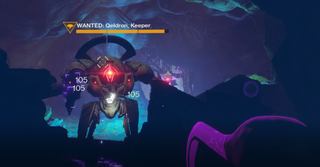 Qeldron, Keeper is a Vex Minotaur encountered in the Grove of Ulan-Tan Lost Sector in Echo Mesa, Io.